The broadcasters have been creating a range of experiences around shows including Stranger Things, Game of Thrones and Stan Lee's Lucky Man. The broadcaster has developed work in-house and partnered a number of suppliers, including brand experience agencies such as The Park and RPM, promotions specialist The Promotions Factory and location-based experiences platform Landmrk. @SkyUK has 210,000 followers and its Facebook page has amassed more than one million "likes". Instagram’s @SkyOne account has 18,600 followers. To celebrate the launch of Stan Lee's Lucky Man, Sky placed luck machines in London, Manchester, Birmingham and Glasgow that were filled with more than 3,500 mystery prizes. Consumers and commuters were encouraged to tweet a selfie accompanied by the hashtag #TryYourLuck to experience the brand activation. Sky enlisted Anthony Joshua in January to surprise boxing fans with a sparring session, aimed at promoting the broadcaster’s loyalty programme, which rewards customers with experiences. A selection of Sky customers were treated to a training session with Joshua’s team, only to later find that they had been sparring with Joshua himself. A 90-second film of the experience was promoted across social media and digital platforms. The streaming service has worked with agencies including RPM and Amplify and partnered mobile phone brands and retail stores. @NetflixUK has 547,000 followers and its Facebook page has just over 54.5 million "likes". Its Instagram feed attracts 470,000 followers. Fans of Netflix’s supernatural-themed Stranger Things were invited to Topshop’s flagship London store to watch two episodes of the series the evening before it launched to the public. Participants could immerse themselves in some of the show’s most memorable moments and experience settings including the "Upside Down", the Hawkins lab, the arcade and Will’s Castle Byers den. Another activation for Stranger Things, staged at Paris Games Week and devised by Amplify, featured a virtual-reality experience and a photo opportunity where fans could pose on bikes. In November last year, Netflix worked with Sky to stage an experience around some of their most popular shows to mark the launch of Netflix on Sky Q. 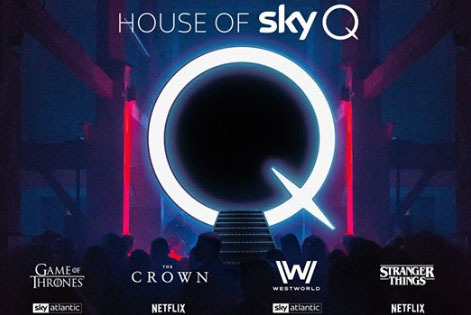 In the "House of Sky Q", visitors could take a seat in the Mariposa Saloon from Westworld or "feel the cold beyond the wall" from Game of Thrones. In the Netflix areas, visitors had the chance to sip tea in Buckingham Palace as shown in The Crown or help search for Will from Stranger Things. Unsurprisingly, both Sky and Netflix are aiming to entice fans and convert new viewers with activations themed around their most popular programmes. Sky is gaining the edge here with its focus on innovation and interaction, going beyond simply recreating moments from shows in a real-life environment.